Kraftig LED lampe i robust Mini Studio Beam hus. LED dioderne i denne lampe sidder sammen 3 og 3 i RGB. Det vil sige at de 3 forskellige farver kommer samme sted fra, hvilket giver et mere "roligt" lys. Bøjle er dobbelt og kan derfor bruges som fod. The Mini Studiobeam RGB is equipped with 7 pieces 3-in-1 LEDs and with high class Italian lenses with a beamangle of 10 degrees. 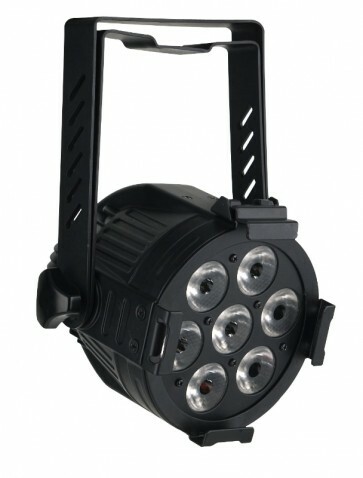 Therefore the item is very suitable for illuminating trusses as well as background lighting. This Mini Studiobeam RGB is equipped with a double bracket which makes the unit suitable for floor use as well.